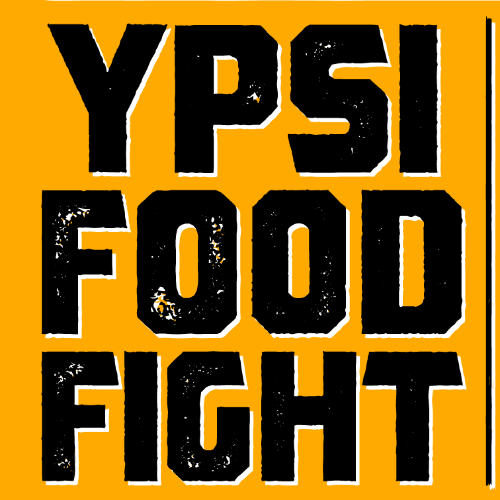 Come to the Ypsi Food Fight to watch six local restaurants battle it out in the ring, going head to head to see who has the tastiest dish. Each restaurant has chosen their best dish and challenged another to a food fight. This is a fun, vibrant evening to benefit Growing Hope that engages local restaurants in friendly competition and gives them a space to share their talents. Five judges will taste each of their offerings in a blind tasting and vote for their favorite. Guests will sample each dish and also be able to vote for their favorite! This high energy, rousing event will be competitive and friendly - tough battles ending with a handshake. Among the community leaders on our judging panel will be special guest Chef Derrell Smith, a finalist on "The Next Food Network Star" and Ypsilanti native. Guests will also have the opportunity to taste all the restaurants' food and vote for their favorite "Bite of the Night". Join us for a fun, tasty night and help us shine a light on Growing Hope's fight for a more equitable local food system.